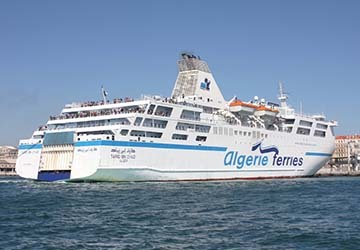 Algerie Ferries - View timetables, Compare and book ferry tickets at directferries.ie. 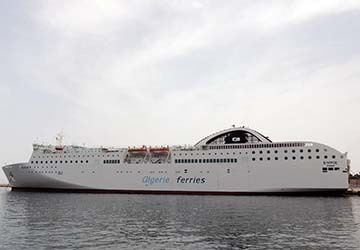 The business was established by ENTMV (Entreprise Nationale de Transport Maritime de Voyageurs) in 1987 and now operates on average 900 crossings per year with their fleet of four large and modern ferries named Djazair II, Tariq Ibn Ziyad, Tassili II and Elryos, undergoing a complete renovation in 2008 and now boasting top class amenities. When you board an Algerie Ferries ship you’ll be greeted by seasoned professionals who will take care of you during your trip. Inside each vessel you’ll find plenty to keep you entertained during the crossing including a choice of restaurants, shops with duty-free products, television lounges, relaxation areas and sundeck bars distributing hot and cold drinks. There is also a selection of cabin accommodation ranging from economy class to luxury suites, as well as comfortable lounges with armchairs. 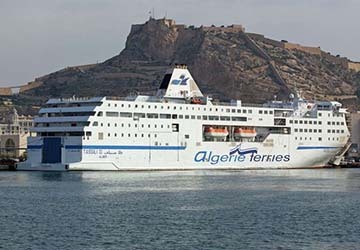 Direct Ferries provides a ferry timetable and price comparison, based on your search criteria, allowing you to compare Algerie Ferries products with multiple ferry company timetables and fares in one search. 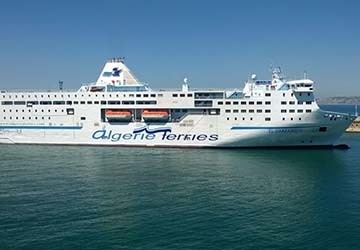 Compare Algerie Ferries timetables and prices now with all alternative ferry operators before booking your ferry ticket to ensure you get the best option for your ferry trip.